The beginning of 1999 saw the launch of the Woodham 300B, two mono single ended triode amplifiers built into one chassis. Each amplifier has its own power supply and output transformer, using uniquely CR designed toroidal transformers. 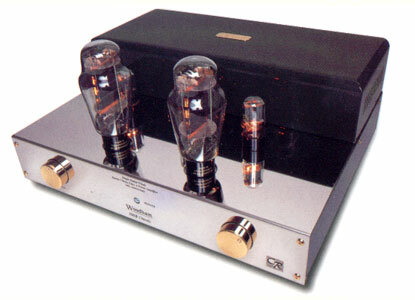 One legendary 300B output triode tube is in each amplifier, driven by a 6SN7 dual triode. There is no negative feedback employed in the circuit, which is inherently very linear. The 300B supplied with the amplifier is made by Sovtek in Russia, however both the Western Electric 300B and KR 300B can be supplied to special order. There is no doubt the Western Electric 300B offers amazing sound quality, but other brands of tube are very close behind, each offering a subtly different presentation. The power output of the Woodham is about 8 watts of pure triode magic for each channel. However, by paralleling the inputs and putting the outputs in series, which a simple operation, the Woodham offers 16 watts in mono. It is this flexibility that makes the Woodham 300B so unique. In some ways the Woodham represents a break from CR 's traditions. The chassis is finished is a smart glossy green and the amplifier is not named after mythological beings, like the other CR Amps. The Woodham takes its name from a small village, which nestles in the Essex countryside, the home county to CR itself.